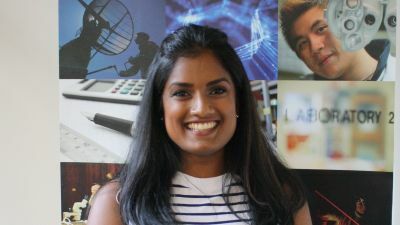 Meet Suvini Perera a Master of Biotechnology student tacking global issues. Biotechnology is the use of living organisms or their systems, to make products of value. It is a fundamental area of applied science that covers a diverse range of specialist fields necessary to take biological and medical knowledge from a discovery to a marketable product. "With the world population ever climbing, biotechnology has the ability to directly answer problems related to the demand for food, medicines and many other key global challenges. The course uniquely offers a taste of both research and industry, so I jumped at the opportunity to explore either option." The course teaches students science, communications and business skills and is designed to provide a higher level of specialised scientific learning together with executive skills training and options in business, communications and management. "As a part of the industry project in the degree, our group has been tasked with identifying the key influencers of a novel peanut allergy vaccine currently being developed by a relevantly new start-up biotech company. Already within this first month of working on the project, I have met three CEOs, put together a professional charter and have begun sketching the competitive landscape for our product. Over the next few months I’ll get to meet other key people involved in the process of commercialising a biotech product, including the IP lawyers and the lead researchers. With access to some of the finest resources, my team and I will put together a report that the company will use." "I have relished the sense of community within the Master of Biotechnology; I’m happy to say that most faces of our year are now familiar to me. There is a strong focus on teamwork in the coursework, meaning that you do a fair amount of group work within your core subjects. It’s been truly rewarding; I met my closest friends in the course through group assignments." This originally appeared in Science's Meet Our Students and Alumni site.